Even with just two offensive touchdowns, the Carolina Panthers utilized a strong game in all three facets to knock off the pesky New York Jets, 35-27 in East Rutherford. Quarterback Cam Newton and veteran running back Jonathan Stewart each found the end zone on the ground and Graham Gano knocked home three field goals for the Panthers offense, however it was two non-offensive scores that really paced Carolina. After the Jets had re-taken the lead early in the fourth quarter at 20-18, All-Pro LB Luke Kuechly scooped up a Josh McCown fumble and returned it 34 yards for a touchdown. On the ensuing drive, Kaelin Clay returned the Jets punt 60 yards for the second non-offensive touchdown in a row, jumping the score to 32-20 in favor of Carolina. The Jets made it a game with McCown’s third touchdown pass of the game with 5:32 left in the fourth quarter but Newton and the Panthers iced the game with a final 11-play drive capped by Gano’s third field goal to push their lead to 35-27 with just 0:25 to play. McCown finished the game completing 19-of-36 passes for 307 yards and three scores while Newton completed just 11-of-28 passes for 168 yards. Rookie RB Christian McCaffrey added a game-high 62 rushing yards on just seven carries while Jets WR Robbie Anderson finished with two touchdown receptions and a game-high 146 yards through the air. With that, we give you our PFF-exclusive takeaways from the contest for each team. Funchess accounted for 108 of the Panthers 168 receiving yards in the win over the Jets, and it would have been even more had he not dropped another for a big gain down the left sideline. Targeted 12 times in the game, he did most of his damage against cornerback Darryl Roberts, beating him for 71 yards on three receptionvs. While Newton didn’t have any terrible turnover worthy throws in this game, he also didn’t make many big throws. Completing just four of the 14 passes he attempted beyond 10 yards, Newton didn’t do much to help the Panthers win the game with his arm. On the ground his nine carries for 30 yards doesn’t jump out at you as making a big impact, though he did force a missed tackle in that part of his game. Kuechly had another remarkable outing against the Jets on Sunday afternoon. 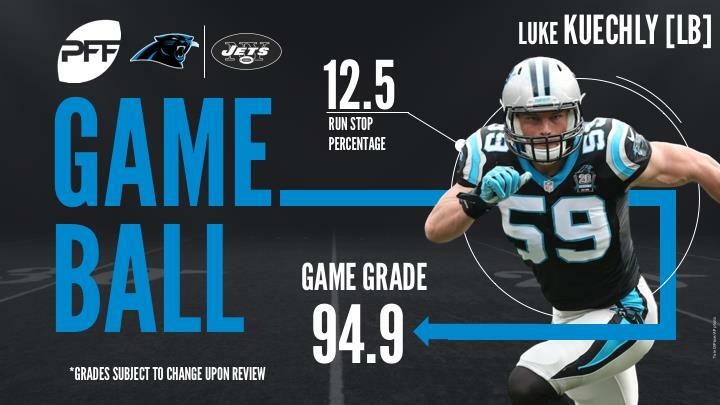 The Panthers linebacker was all over the field as he made an impact in all three facets of the game. Kuechly did not allow a single reception on the day as he was constantly in good position in coverage and even broke up a pass. Furthermore, he proved to be unstoppable for the Jets offensive line as he quickly recognized run plays and attacked blocks successfully at the line of scrimmage. Although Short picked up three stops on the day, majority of his grade came as a result of his pass-rushing performance against the Jets. The Panthers defensive lineman picked up one quarterback hit and two hurries on the day; however, he beat Jets blockers on multiple other occasions just to see QB Josh McCown get rid of the ball before he could get to him. McCown had a decent game and had the Jets leading against Carolina up until his costly fumble that was returned for a touchdown in the fourth quarter. The Jets signal caller performed well when he did attempt a pass under pressure, as he had a passer rating of 117.8 in those situations. Furthermore, he completed three of his six deep attempts (20-plus yards in the air), including going two-for-two for two touchdowns outside the right numbers on deep passes. Anderson did not seem to slow down from his torrid pace, as he delivered once again as McCown’s primary target. Anderson caught all six of his catchable targets for 146 receiving yards, including three receptions for 115 yards on deep passes. In addition, the Jets wide receiver had one of the most impressive touchdowns you will see all season. While tightly covered by two Carolina defenders, he caught a pass and made sure his feet were still in bounds to secure the score. Claiborne had an outstanding day for the Jets, allowing just one reception for six yards from the four passes thrown into his coverage. Claiborne broke up one of his targeted passes his way, and he also made his presence felt to prevent the Panthers scoring on a two-point conversion. Claiborne wasn’t the only Jets cornerback who impressed despite a loss, with Buster Skrine making plenty of impact himself. Targeted six times in coverage, tied with Darryl Roberts for the most for a Jets defender in the game, Skrine allowed just two receptions for 27 yards, and came away with three pass breakups.